It can help save millions of precious lives. Betty and I went to see the movie “Unplanned.” It is our earnest prayer that every American will not only see this movie, but also experience the supernatural impact so desperately needed during this very dark moment in the history of our nation. 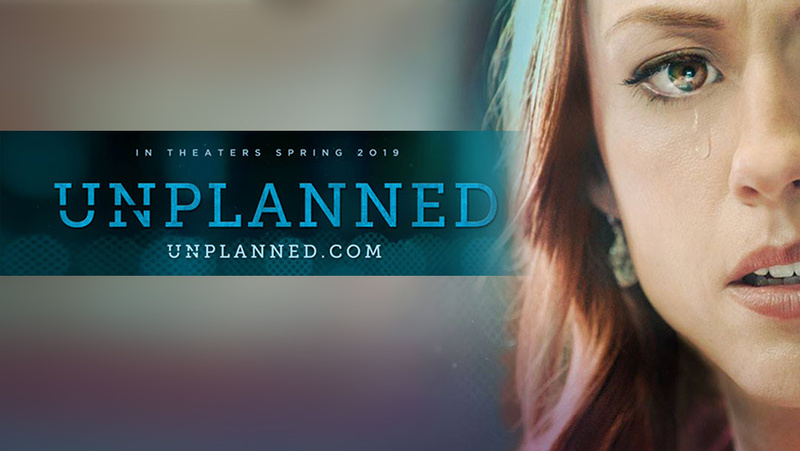 I believe with all my heart that the indescribably powerful message of “Unplanned” is a direct answer to the prayers of those who love God and love their neighbor with all their heart. In my opinion, the actors were perfectly cast and they fulfilled their role with God-given talent, and divine enabling. It’s a true story. Betty and I hosted Abby Johnson on the LIFE Today show when the book Unplanned (her amazing story) was first published in 2012. We knew God had worked a mighty miracle in her life. As a young woman, she aborted two children, and she did so in spite of the fact she had God-loving, life-loving, precious concerned parents. Even so, while at Texas A&M, one of the most conservative universities in America, she began working as a volunteer in a Planned Parenthood abortion clinic. Who would have ever thought this young lady would become the clinic director of what was to be the largest abortion center in the world? Please go see the movie and encourage everyone you know to see it. You will witness what it will take to end this awful holocaust, the slaughter of innocent, precious little babies who are totally helpless. When I saw the scene that Abby witnessed which miraculously began the turnaround in her life, I watched the depiction of the little baby in the womb clearly and visibly pulling back and recoiling to get away from the probing medical instrument and suction that would rapidly rip its tiny body to shreds. I watched the little legs kicking fiercely trying to stay out of the tube until they were sucked in and then the upper body, hands and arms flailing, trying not to be taken. Please do not let this depiction for one moment stop you from recognizing the reality of what’s happening in these clinics, and now even all the way up to birth the lives of little innocent ones are no longer safe. I never thought this would happen in the United States of America, one nation under God, indivisible. President Ronald Reagan said, “When America is no longer a nation under God, it will be a nation gone under.” Believe it! Years ago we rightly, forcefully cried out against the German fascist slaughter of six million precious Jewish people. Think of the horror of it. Multiply it a thousand times. Sixty million innocent babies have been taken out in their mother’s womb. Their mothers may not be able to talk about it. We don’t want to put more hurt and pain on them because I believe most of them will tell you they bear the pain, and they wish as Abby did that they’d never done it. God’s grace and mercy is the only thing that can heal the hurt of that mistake. It will be the power of prayer and love that will stop the abortion holocaust in America and around the world. You will also see in this movie how damaging “religion” can be. How foolish to think you can cure the problem by killing someone who was deceived into the practice, or that you would try to make people feel guilt and shame rather than show them the beauty and indescribable potential of every precious life. They could give their baby an opportunity to be adopted like we adopted our son Randy, the father of four of our wonderful grandchildren. To me the greatest part of this story is the way the Christian group “40 Days for Life,” led by Sean Carney and his wife, prayed fervently and demonstrated the sweet love of Jesus through their actions. You will witness the loving way they responded when they were pressed and pushed back against, and that’s what led to the eventual transformation of Abby Johnson. It will be the same power of prayer and love that will stop the abortion holocaust in America and around the world. I believe it angers the Lord and breaks his heart as He sees what is happening to the innocent. He is anxiously waiting to pour out His redemptive love and transforming power through yielded vessels and members of Christ’s body. Those of us who know Jesus must pray for the miracle that occurred in the life of Abby Johnson to happen in the majority of people in the United States. Because of our constitutional rights, we have the freedom to choose representatives who will protect the precious lives of the innocent and seek to help the American people, not hurt them, and certainly not slaughter them. We must choose leaders who will defend life with courage, conviction and compassion. We must enforce laws that protect life and freedom, but godless, lawless hearts will never obey even perfect laws. The answer is what you witness in this movie — the transforming power of prayer, redemptive love and a faithful Christ-filled witness. Go see it! Share it. I am so grateful to be alive and sharing the preciousness, beauty and potential of life all over the world!